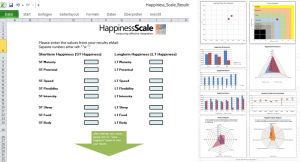 The Happiness Scale (HPSS) is a psychological measurement instrument to measure individuals levels of integration of structures, and balance of flows in thinking, feeling and acting, which are needed for decision making and problem solving processes. In our understanding, short term happiness is a mental state, but long term happiness is a lifelong process of learning and adapting to change. People are sustainable happy, when they are better in solving problems, than they are in creating problems. This is the “social constructionist” concept, that all problems are just self constructed by ourselves. In that sense are all problems the result of “misunderstandings” and “false assumptions,” hence communication or perception problems. If structures are not integrated we experience conflicts and problems. Too little information leads to false assumptions, too much information leads to misunderstandings. Too little emotion creates loneliness, too much emotion creates repulsion. Too little energy leads to bore-out, too much energy leads to burn-out. Take the test and find out, which of your structures are tense, and information, emotion and energy can’t flow properly. Enter your values from the “Results eMail” that was sent to you after completing the questionnaire and view your results in graphical illustration. 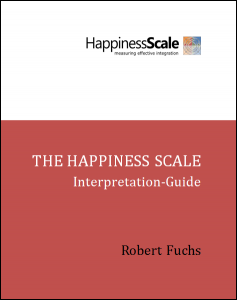 The guide explains your scores, and how you can change to become happier with yourself, and with the world around you. It is available in two language versions. There are already too many tests out there to measure strengths and weaknesses, so why do we need yet another one? Skill and abilities in problem solving are usually measured using “aptitude tests” like MBTI, 16PF, MMPI2, Strength Finder, Reiss Profiles, Birkman and many others. The problem with those tests however is, that they don’t differentiate between absolute and relative strength. Absolute strength is the overall strength of a skill, while relative strength is the ability of finding the best solution in a specific situation utilizing all skills together. With other words, relative strength integrates all resources, while absolute strength focuses on one skill only, independent and not integrated with the others. Aptitude tests are based on the assumption, that if people do what they can do best, their chances of becoming happy and successful are the greatest. This is true for up to about 80% of the cases. We object this “unchangeable” view of human personality fundamentally, because we see people changing and transforming all the time. In addition, once personal preference is not in 100% of the cases what is best for all parties involved. Aptitude tests measure preferred ways of thinking, feeling and acting and defining them as strength. The problem of duality however is, that our biggest strength in some situations (at least 20% of the cases), are also our biggest weaknesses in other situations. If we want to be able to find the best solution in 100% of the situations, absolute strength is therefore not helpful. The most important skill is therefore “adaptability” or mental, emotional and behavioral flexibility. Darwin defined the ability to adapt to a changing environment as the greatest strength. We believe the same is true for all living beings. The story of David and Goliath nicely illustrates the point, that relative strength is worthless if the conditions change. The ability to change or “reframe” conditions is therefore the biggest skills in all creative problem solving processes. The HPSS measures integrated strength or creativity and not relative strength, because relative strength leads to one sidedness and ultimately to tensions and injuries, while integrated strength allows for adaptation to continuously changing conditions as well as changing conditions oneself.